BLOODHOUND SSC, the British engineering showcase that aims to break the world land speed record by achieving the supersonic speed of 1,000mph, is back in the borough this week. It is back as part of the borough's children's festival having been the star attraction at the recent Get up to Speed with Engineering and Manufacturing (GUTS) event which attracted more than 2,000 visitors when it was held at Magna in April. Stuart Ballard, education manager at Magna, said: "Two thousand people came to see the Bloodhound when it was here in April so we're delighted to welcome it back. "It's great that it's visit ties in with Father's Day weekend, as we're sure that most Dads will love to see such an impressive car first-hand. "Here at Magna we love to put on and get behind events that aim to inspire scientists and engineers for the future; and the Bloodhound is a fantastic way of helping to do that." Visitors will have the chance to experience a 1,000mph-driving simulator, along with exploring key components including a model of the hybrid rocket, wheel, steering wheel and 3D printed display. 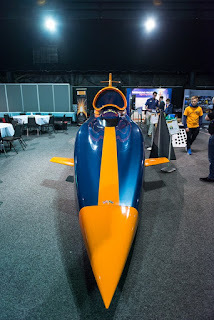 They will also be guided around the full size Bloodhound model and understand the design challenges and science that goes into building the world's fastest car. The team of engineers who built the car will be on hand to answer any questions. The car will be on show at Magna between 10am and 3.00pm on Saturday June 18.